According to research done by the Institute on Taxation and Economic Policy , the undocumented contribute a significant amount of money in local and state taxes. 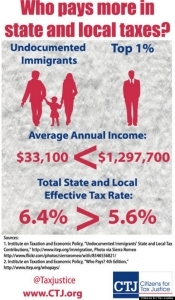 It is estimated that the undocumented contribute as much as eight percent in taxes into the local and state economies. This is true in regards to California, which has the highest estimated number of undocumented. These taxes include indirect taxation on utilities as well as clothing gasoline, and so on. The study does not include how much any state expends on social services provided to the undocumented. >From what I gather, the undocumented do not get much in social services. They are not allowed to receive welfare or food stamps (they can only receive schooling for their children and emergency hospital care). In some states, they might be able to get driver’s licenses. They are not allowed anything that a legal permanent resident or a U.S. citizen receives, and they most certainly cannot vote. So the undocumented provide a LOT of money that they will never receive in benefits. According to the U.S. Social Security Administration, undocumented workers, and their employers, paid an estimated $13 billion in payroll taxes that the undocumented will never receive (2013 estimate). This tiny aspect only deals with one aspect of the whole immigration question, and the undocumented in particular. Some will say that the child(ren) born and raised in the United States can receive social services and therefore those who have undocumented parents or parent can indirectly receive the same said social benefits. That is splitting hairs, and what has to be taken into account is that children born of undocumented parents cannot petition for a change in their parents’ legal status until the American-born children are 18 years old. Whatever social benefits any undocumented parents may receive only go to the children and no one else. It is a sad commentary in our days when immigrants, and especially the undocumented, continue to be demonized in the press, in campaign slogans, and by white supremacists who are trying to find scapegoats for their own ends.